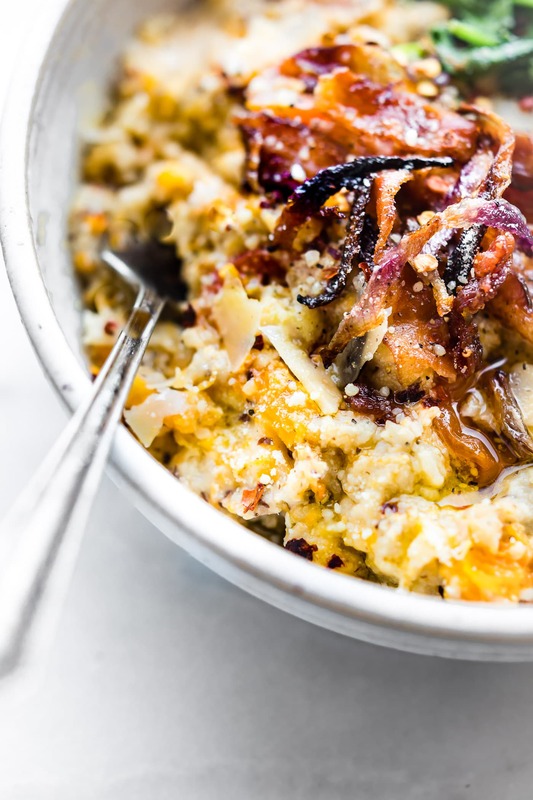 This Savory slow cooker oatmeal with crispy bacon will make you jump out of bed! A savory spin to your regular sweet oatmeal and total crowd pleaser dish, which is perfect for busy mornings! 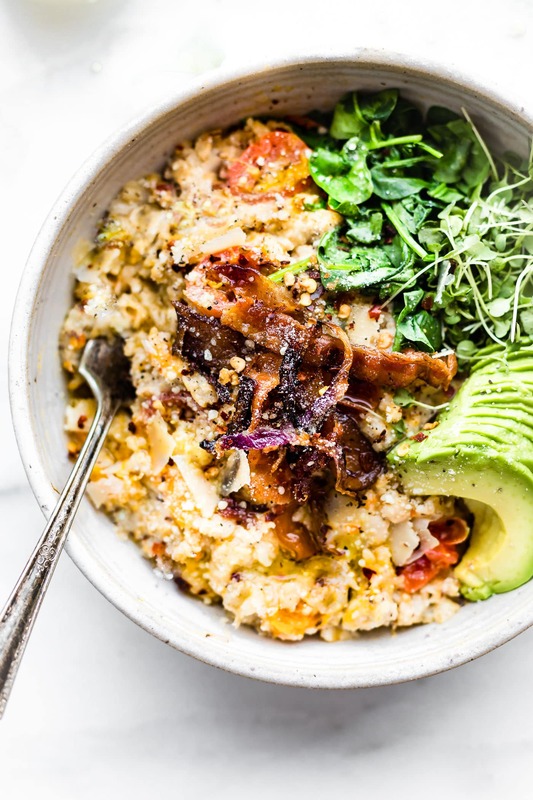 A Slow cooker oatmeal made with the addition butternut squash, garlic, herbs, parmesan cheese, and topped with crispy bacon and avocado. An easy to make well-rounded healthy meal for any time of day. Dairy free options too. Hi brain. Are you there? It’s me Lindsay. Um, no, this brain is checked out and on island time. Did I mention I was on vacation? In Hawaii!! For our 10 year anniversary and our first REAL vacation ever? But I have WAY MORE to say on that later. I know I know, I’m super corny and should be off enjoying vacation, which I am, but I could not end the week without sharing this today. We are celebrating the start of cozy CROCK POT & SLOW COOKER recipes season ya’ll. YES! 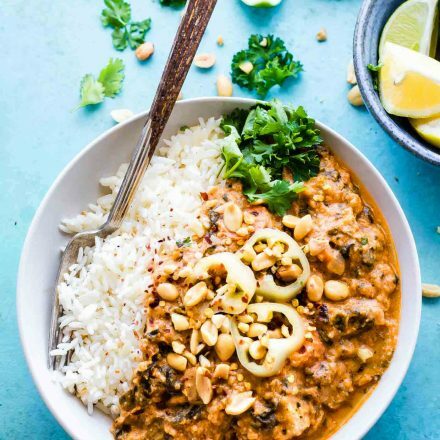 Slow cooker recipes are my jam, all kinds! But since it’s almost Fall, I have an extra love seasonal slow cooker recipes. Like slow cooker vegan white bean mashed potatoes, slow cooker squash soup, slow cooker chili, and you guessed it… Savory slow cooker Oatmeal …. with crispy bacon to be exact. OHHHH MY GAWD! How have I gone so long without slow cooker oatmeal? Gluten free savory oats I have done, but only the quick stove top or microwave version. We top our “quick” savory oatmeal with egg ALL the time, been doing it since my husband’s pro triathlon days. That type of breakfast was his FAVORITE post swim recovery meal. Gluten free oats, melted butter, a touch of sea salt, real cream, egg, and tabasco. Yep. It’s unreal good and I think you should try it. But I digress, back to this beauty of a bowl! Slow cooker oats! LIFE CHANGING when it comes to savory. Here’s why. You can pack in more veggies, savory sweet starches. Like sweet potatoes or squash give it a little sweetness without any added sugar, not to mention it adds more texture. Adding Aged Cheese or Nutritional Yeast (for dairy free peeps) makes these slow cooker oats taste like grits. And oh HOW I love “grits.” Cauliflower grits anyone? 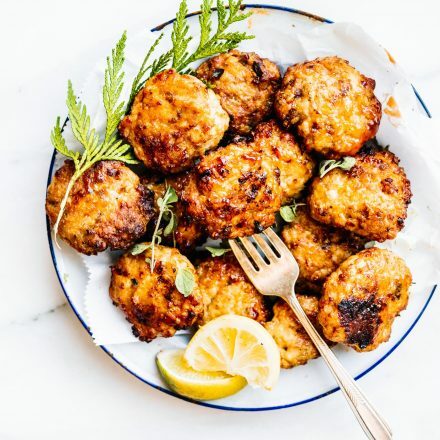 This is the PERFECT dish for breakfast, meal prep dinner, the holidays, a balanced post workout recovery meal, or weekend brunch. Seriously, it will feed a crowd. Even manly men who don’t consider oats to be a real breakfast. Well these oats for reals! Men will be in heaven with savory slow cooker oatmeal. But I kinda think the crispy bacon might also have something to do with it. More on that below. AVOCADO creaminess. 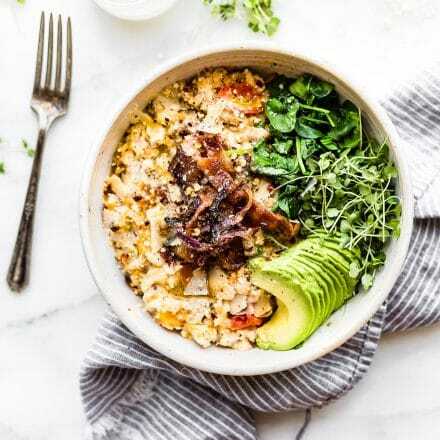 Watch out Avocado toast, avocado oatmeal just one upped you. Or so I like to think. Last but not least –> Bacon. Okay here’s my secret to these savory oats. The KEY “LIFE CHANGING” ingredient. You ready? Bake the bacon with onion either first or half way through cooking the slow cooker oatmeal. 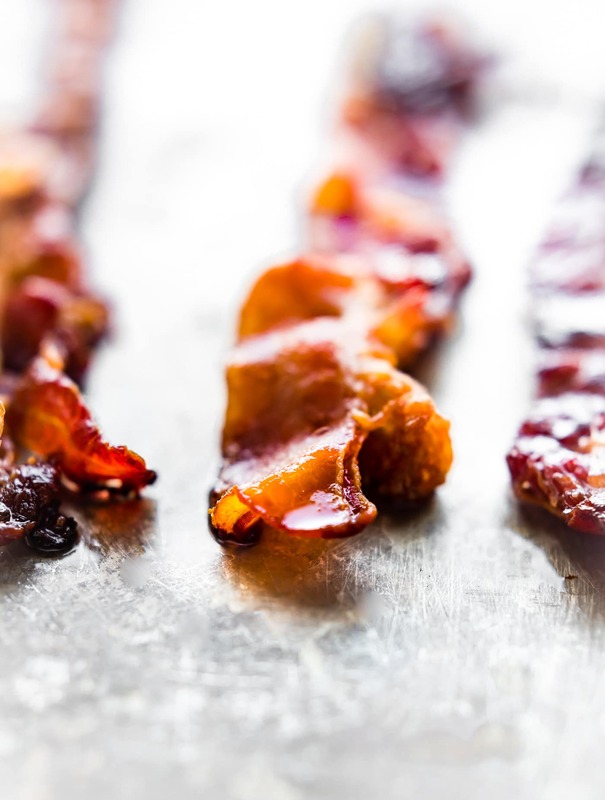 It’s easy and baking the bacon makes it more flavorful and crispy. Once the bacon is done baking, keep the bacon grease from the pan and pour it into the slow cooker oatmeal. Bonus –> You’re kitchen will smell like a campfire big breakfast. It’s AMAZING and so cozy. I know what you’re thinking. Bacon grease? Ugh, that’s so unhealthy. And I would have to reply with ….. ya’ll…. GET the right kind of BACON. Bacon is real food and little goes a long way. Uncured, nitrate free, non-gmo, humanely raised, and all that super duper real food jazz. If you’re not into the crispy bacon, that’s totally fine, adding an egg or even tempeh bacon on top is delicious and nutritious. Mmm k? Alright, enough bacon and savory oatmeal chit chat. I could go on but let’s jump to the recipe and eat already. The good thing is that this recipe basically makes itself, so when I say recipe, I mean throw it in the slow cooker, mix, and press start. Easy peasy cheesy! 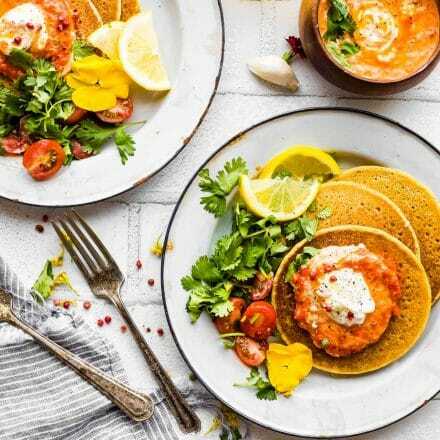 Place the gluten free oats, diced peeled squash, tomato, butter or oil, flaxseed, garlic, seasoning, milk, broth, and parmesan in the crock pot or slow cooker. Mix all together and set on high 3 hrs or low for 5. Could be more or less depending on your slow cooker. Stir and scrape the sides of the slow cooker every hour if you are using real cheese. The flaxseed with help bind everything together and thicken it up like steel cut oats. Add a 1/4 c more milk or water if you want to thin out the oats (to create more of a porridge) the last hour of cooking. When the slow cooker oats are about ready, preheat oven to 350F and Line a baking tray with foil. Place bacon strips and sliced onion on the tray on top of foil. Bake for 15 minutes or until crispy. Reserve 1/2 to 1 tbsp of the bacon grease. Stir the extra bacon grease into the oats before serving. 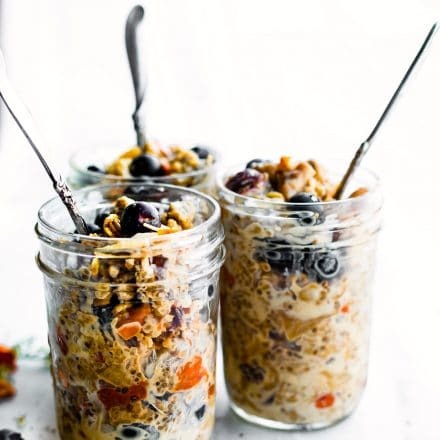 Spoon savory oatmeal into bowls. Add your toppings of choice (listed) and crispy bacon with onions to garnish. You can cook this overnight if you have an automatic slow cooker that shifts to warm after 5 hrs. If so, I recommend adding the the cheese in morning. Or use a slow cooker liner so the cheese doesn’t burn the sides. I may be bias, but the whole crispy bacon and avocado and steamed greens addition = is like a buttery BLT in oatmeal form. Ya, addicting. I’m also debating on trying slow cooker polenta or millet with the savory spin. I think it will be perfect for those cold mornings. Ya, I live in cold climate now. NEEDED! For those of you who make slow cooker oatmeal, what do you put in them? Sweet or savory? I am ALL about savory oatmeal! This looks delicious! thanks lovely! I knew you’d agree. Totally in love with the fact that you made oatmeal savory! I havent had savory oatmeal in ages. And ive never made it in a slow cooker, but I love the idea! right? It needs a comeback! Hmm…oatmeal with bacon YES! Everything is just better with bacon. You are so right about that my friend! ANYWAY… I love this idea, love the slow cooker take. I’m totally going to try these if it EVER cools off here. let me know if you try it friend! I literally can’t even. Yup just said that 😉 !!!! Not only does this recipe sound amazing the photography is STUNNING! haha you are too good to me! I will work on moving you here ASAP! I’ll admit I’m not the biggest breakfast (or morning) person in the world, but this does look good. And sitting here at work on a Friday afternoon at 2:30, that crispy bacon is looking mighty tempting about now. Sigh! I hope you’re enjoying Hawaii. I have been following along on your IG stories. Have a great weekend! I feel ya! But this totally works for Brinner. And thank you for following on IG> it’s been UNREAL! Needed rest too, ya know? Happy vacation, Lindsay! 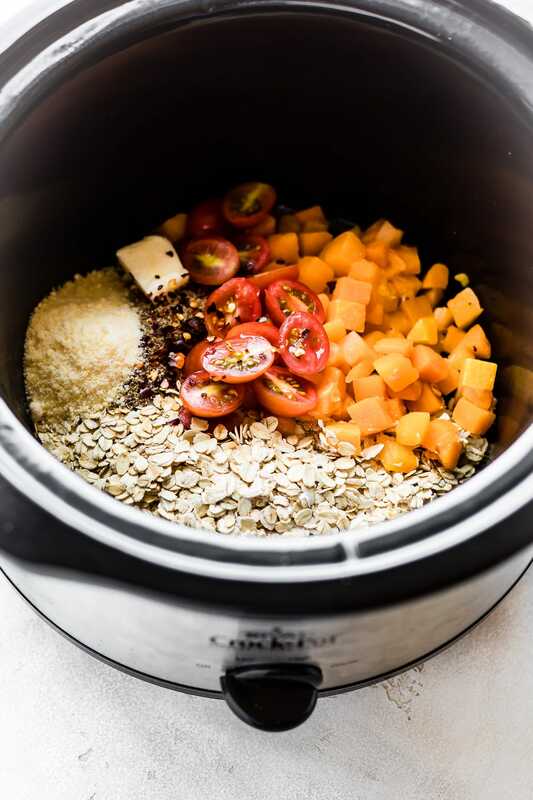 This slow cooker oatmeal is a really clever idea–now I want to try my own savory oatmeal! thank you friend! and I bet you’d love this with nutritional yeast and coconut bacon!! For sure! SO much yum in this bowl! Seriously delicious ingredients! 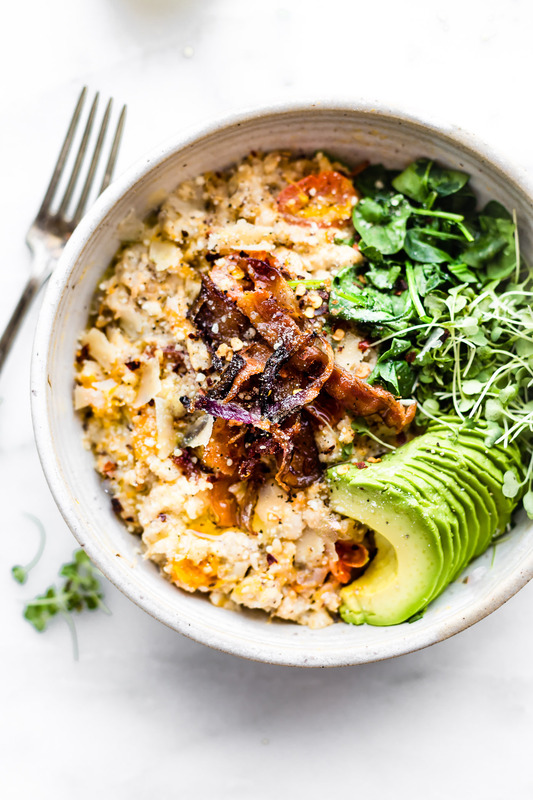 I’m excited to check out this savory oats idea! yea! let me know if you do Melissa! You are a genius. Now go enjoy your vacation and by vacation, I mean that husband of yours. Such a great slow cooker dish!! You had me at crispy bacon! 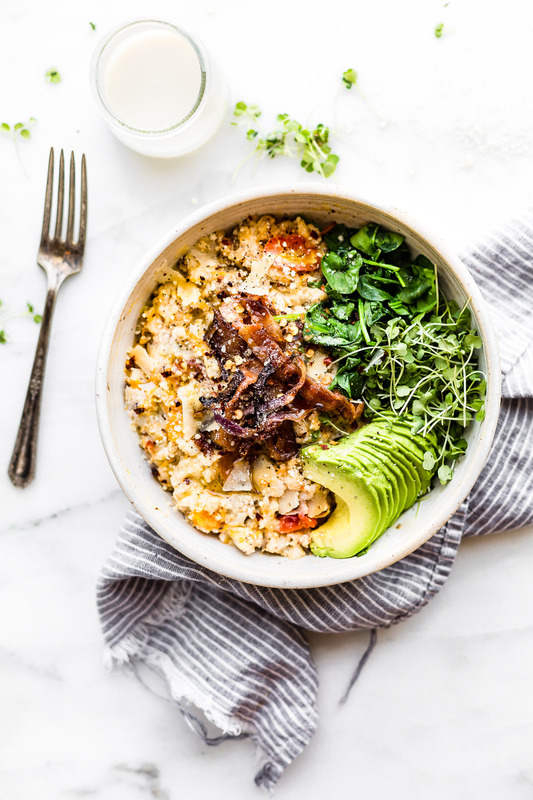 Savory oatmeal…why the heck not when you make it look like this!! Ohhhh I haven’t made savory oatmeal in forever. Thanks for reminding me about it! And even better because it’s in the slow cooker. Perfect for busy mornings! I love more ideas for savory instead of sweet breakfasts! OH EM GEE!! YUM!! I need this in my life! WOAH!!! this is SO pretty and drool worthy! 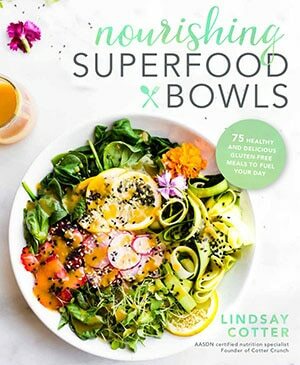 Would I be able to use quinoa instead of the rolled oats? You mention a cup of water in recipe but when you describe the method, the water is not mentioned. sorry about that. I just adjusted the recipe. I used the extra water to thin out the oats half way through cooking. That’s if it needs it. It depends on your slow cooker and the oats you use. So if you see the oats are getting to thick and dry half way through slow cooking, you might add more milk or water. Does that make sense? I tried making this dish once but it seems I have failed, maybe I should try again with a more accurate way. 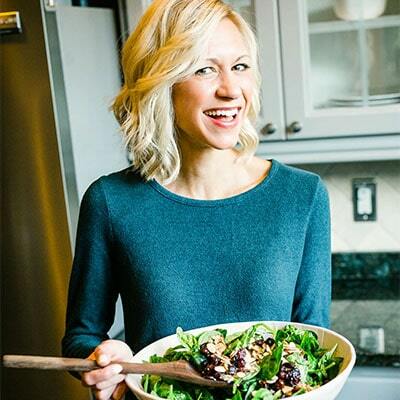 I have been cooking a lot lately, trying many different healthy recipes found on a blog such as yours and I have to say this is THE BEST oatmeal I have ever tasted. I have been suffering from constant diarrhea issue and so the doctor had advised me to include oatmeal in my diet. I would definitely recommend it to people who face similar health condition. Thanks for sharing such an amazing recipe. Thank you for giving so many amazing sounding recipes! I have to say this is THE BEST oatmeal I have ever tasted. I have been suffering from constant diarrhea issue and so the doctor had advised me to include oatmeal in my diet. I would definitely recommend it to people who face similar health condition. Thanks for sharing such an amazing recipe. Great recipe. I have been suffering from constant diarrhea issue and so the doctor had advised me to include oatmeal in my diet. I would definitely recommend it to people who face similar health condition. Thanks for sharing such an amazing recipe. This looks amazing! Have you ever tried making it in an instant pot for faster cooking? I’m trying to figure out how that might impact ingredient ratios and cooking time. I think you could! 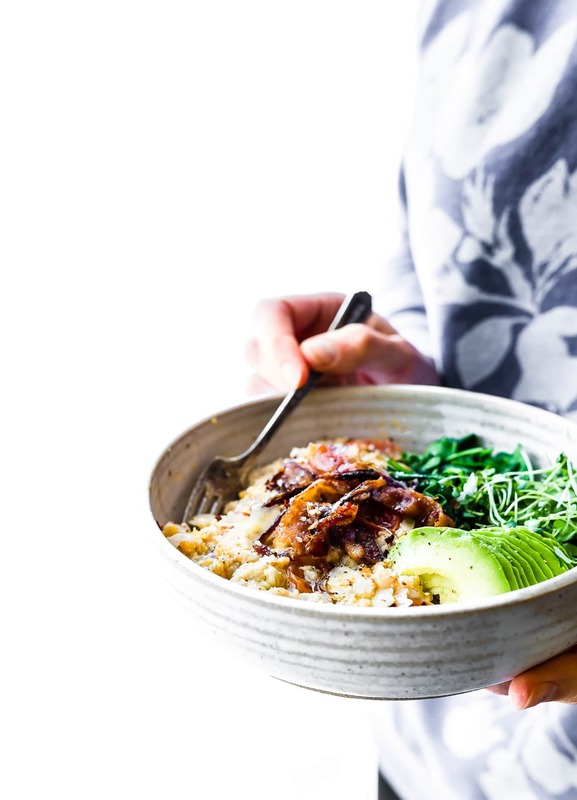 maybe try similar settings that I do for my superfood instant pot oatmeal recipe. Do you have that?